The Beginner’s Package – it will help recent chess players to get very strong foundations and to be ready for the competition. 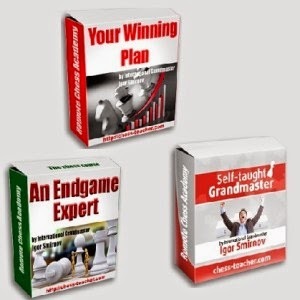 The Intermediate Package – where you’ll learn how to build a good plan and how to master endgames, and receive the best training materials. 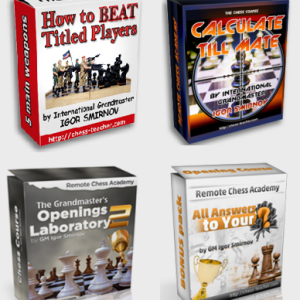 The Advanced Package – for advanced players who plan to become a chess Master. The Quick Jump package for beginners is guaranteed to give you a solid foundation to the aspiring new chess player. Please, don’t be deceived by the words “beginner package”. Many of modern titled players don’t have this fundamental knowledge. And that’s why they stuck in their progress. There’s a stage in your chess progress when you can’t leap forward anymore. Instead you should be persistent and have a steady growth. Don’t underestimate its value! Even a very small 1% improvement a day, will bring you awesome 365% improvement in a year! Here you need to pass “the chess school” and get a comprehensive knowledge about chess. You can’t move forward without it. Studying this intermediate package will keep you on the right track and will ensure your steady growth. This Package is aimed for people with an advanced chess level who are seeking to become a chess master! 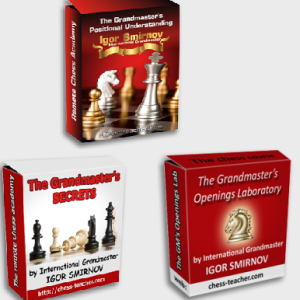 You will get ‘The Grandmaster’s Opening Laboratory -2 Bonus pack” worth $25 absolutely free. Weak players make a lot of mistakes and it’s not that hard to beat them. But how can you overcome an equal or even a stronger opponent? This is a tough question for most of intermediate players. Strong opponents are well familiar with common tactics. They know opening lines just as good as you (if not better). They follow all classical strategic rules: exploit weak squares, fight for an open line etc. So how can you overcome them? Standard knowledge is not going to help you anymore. Here you need something really powerful. You need to play highly tense, dynamical games. You should sort our complications better than your opponent. You must start a BIG FIGHT and wrest a victory! This advanced package will help you beat strong opponents, and get to the TOP level. The advantage of these packages is that you’ll get a huge discount (between $50-57). As you know, our goal is to provide quality courses for our students and to see their improvement. I am receiving lot of positive feedback from them, and today I will share some of this with you. It’s Time to thank you for your professional and also amusing chess-teaching. I had a great time during the Austria – championship within the last 6 months. Within the 12 rounds I won 10 games, only 2 draws (repetition traps) 0 defeats, and my rating increased 130 Elo just in 12 games. Last week my team got the title already 2 Rounds before the End. There are a lot of good chess-sites in internet, but yours – is definitely THE BEST one. Serious chess-learning could be very hard, but with your motivating and fresh manner it’s a pleasure – THANK YOU”! I am ecstatic about your products!…so far I have GM Positional Understanding, Winning Plans, and Endgame Expert…I love everyone of them!..I like the teaching method (in depth explanation of principles with concrete examples, ongoing review of principles/ideas expressed, conclusions). Amongst his many chess skills GM is also extremely sensitive to the listener and works very hard to promote the understanding of the principles he discusses. I am very grateful and wish I had learned these principles when I was a boy. “At my peak I was an 1800 player who often beat 2000+ players and often lost to 1400 and lower players (hence my rating in between the extremes!). I worked hard for ages but never improved my rating or my consistency, which lead me to quit for years. GM Smirnov’s courses revolutionized chess for me. I can’t put it any other way. I see the chess board differently. Looking at my old games is comical, I don’t play much chess right now as I’m currently studying his courses, so I can’t give you my current rating as a comparison. I CAN say, though, that I beat a 2000 player fairly recently, even after my break from chess, and I’ve started drawing against Fritz (well, lots of losses, but not 100% losses either). GM Smirnov instead focuses on a few principles, which if you understand will then lead to the most important aspects of a position, and ultimately the best move. Lesson 3 of GM’s Positional Understanding is a perfect example: he analyzes a game between two world champions using just his principles, and everything seemed clear and even obvious. Indeed, after watching that, I was hooked, and I’m slowly studying all of his courses one by one. I’ve learned more useful and usable knowledge in GM Positional Understanding than all the other books I’ve read in the last 10 years put together. Someday I’ll be master strength, and it will be because of Igor Smirnov. That’s my firm belief and conviction”. I get lot of feedback every day, but it would take me too long to share all of these messages with you. But I encourage you to send me your feedback and it will be a pleasure to read it and reply to you.